PGI for the model, as always, thanks you guys. SolahmaJoe is credited with his work on the first Marauder port. Though I haven't really used much of his work, beyond some JSON work for which I am grateful, he deserves so much credit for this process and his invaluable contributions. Thank you, Joe, so much. The Marauder Has Arrived! Again! 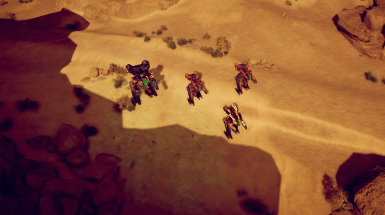 So, I did not make the Marauder the first time around, that honor belongs to SolahmaJoe, who kickstarted the entire mech import process and without whom this mod and all the other mech mods could not be possible. However, with respect to Joe, the Marauder was originally made with a new process that was not understood and had many problems. Because of this, I decided it was time to update the old Marauder and give it a makeover like it deserves now that we fully understand the mech import process and can make the fine details a reality. So, here it is, updated for the modern day! Enjoy! The Marauder is a 75 ton heavy mech that carries strong armor and decent speed for its size while also carrying good armaments still. It is considered by many to be *the* heavy mech that defines what it is to be a good heavy and I would agree with that. It comes in four variants, most of them carrying energy and ballistic armaments (one variant carries all energy though). The basic variant is the Marauder-3R, which carries a pair of PPCs, a pair of Medium Lasers, and an AC/5 with a ton of ammo. It has some heat sinks, but not enough for sustained fire, so be careful. The second variant is the Marauder-3D, which trades the AC/5 for a Large Laser and some heat sinks, but is otherwise the same as the -3R. It has severe heat issues though so be careful with your shots. The third is the Marauder-3L, which is the same as the -3R but changes one PPC for a Large Laser and heat sinks. It is pretty good on heat though, being colder than the -3R. The last variant is the Marauder-3M, which is the -3R but drops both PPCs for a Large Laser in each arm and extra heat sinks. The -3M is the coldest Marauder variant by far, having virtually no heat problems at all. However, this is not all. There is also the Marauder II included here, which is a 100 ton assault mech with lots of armor and a trio of jump jets for manueverability. 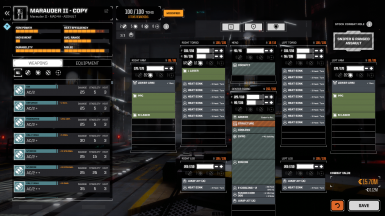 For weapons, it's a little lightly armed for its size, only 2 PPCs, 2 Medium Lasers, and a Large Laser, but it carries so many heat sinks that it has very good heat dissipation. Don't underestimate the Marauder II when you face one on the battlefield. The Marauder is a ModTek mod, so you will need BTML and ModTek. You can find them here: BTML﻿ and ModTek﻿. However, the Marauder comes in two versions, one of which requires an additional mod to work. 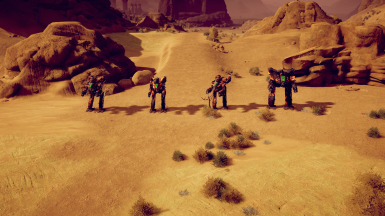 The Marauder comes in a vanilla version for the vanilla game and comes in a MechEngineer version for those players who are using MechEngineer (if you're not sure which one you're using, check the photos above to see what a MechEngineer MechBay looks like, if your MechBay looks different then you want the vanilla mod). Delete the Marauder folder by SolahmaJoe from your Mods folder. Drop this Marauder folder into your Mods folder. 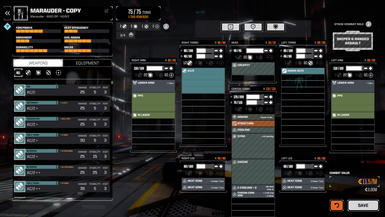 Note that if you have other mechdef/chassisdef files that use Marauder assets, they will need manual updating to match the new bundle and prefabidentifier from this mod, so be vigilant about installing this and keeping your mods straight. If you don't know what that means, it probably doesn't apply to you. If it does apply to you but you don't know how to do it (for some reason), come to the Discord and we'll get you sorted out. 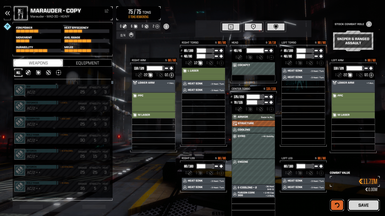 As a mech mesh ported from MechWarrior Online, the model isn't perfect and has a few minor issues. However, thanks to the process have been using, there are far fewer issues than my other mechs have. Texturing is still not perfect, I'm still learning. 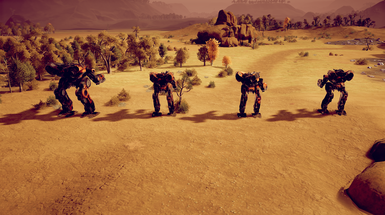 Until the Marauder II and the Corsair are released, I am out of MWO mechs I want to work on. I think a kitbash is in my future, but not sure what it will be yet. For the time being, don't expect too many more mechs from me until April. GentlePayload and Colobos remain great friends and great sources of aid and advice. Thanks, to both of you.